How Does an Electric Vehicle (EV) & its Motor Work? How do electric cars work? That’s a question many people are asking today. Well, for one, electric cars are much simpler than conventionally-powered cars that rely on internal combustion engines for their power. With electric cars, a large battery pack is used to store electricity which powers an electric motor that in turn, drives the wheels. Electric cars don’t require transmissions, either. That’s because unlike internal combustion engines, 100% of the torque of an electric motor is available at very low speeds, so multiple gears aren’t necessary. With internal combustion engines, the amount of torque needed is only available at a narrow band of engine speed. Therefore gears are needed to keep the engine speed where it needs to be for power and efficiency. Electric cars today utilize one single reduction gear, so from zero to their top speed, they are always in the same gear, that’s how electric cars work. For many years, car makers have touted the engines in their cars as one of the advantages they have over their competition. From straight-six cylinders, to V-8s and even some V-12s, performance cars in particular had their engines front and center in marketing the vehicle. But what about electric cars? Do manufacturers talk much about an EVs motor in their advertising? And how does an electric motor work, anyway? Not surprisingly, most electric car manufacturers don’t talk much about their electric motors. That’s because unlike the technology found in internal combustion engines, most people really don’t know the differences in electric motors. 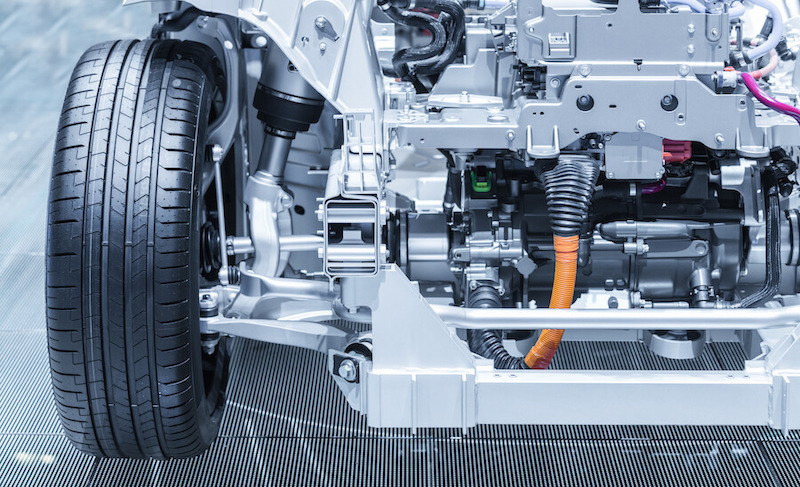 There are basically two different types of motors used in modern electric vehicles: Permanent magnet and AC (alternating current) induction motors. The basic differences are that permanent magnet motors require rare-earth metals and are generally more efficient and AC induction motors use stacked steel laminations with buried peripheral conductors, and are better suited for high performance EVs because they can produce more power. They use about the same amount of energy, and in 2018 AC and DC motors both have cutting edge technology to boost performance and efficiency. Tesla, for instance, uses an AC induction motor for their Model S & Model X. Both are large, high-performance vehicles, but switched to a permanent magnet motor for the Model 3, which is lighter and more efficient. In doing so, Tesla demonstrates that different types of electric motors are better suited for different kinds of electric cars, depending on how the electric motor works. People researching how to convert a car to electric must decide between cost and performance, and there’s no one simple answer as to which type of motor is better for an electric conversion. The refueling process for electric cars is also dramatically different than it is for conventionally-powered vehicles. With gasoline or diesel cars, the owner goes to a refueling station and fills up the tank with the liquid fuel. With electric cars, the owner plugs the car in to recharge the battery. Depending on the type of charging station, and how large the battery on the electric car is, it can take as little as a half an hour to recharge the car, and as long as a couple days! That’s because electricity can be delivered very slowly from a simple household or very rapidly from a DC Fast charge station. Most people charge their EV daily from a level 2 charging station, and leave their home with a fully charged battery every day. Summing up, the basics of an electric car are the owner plugs in the car to charge the battery, which powers the electric motor that drives the wheels from a single speed reduction gear. With conventionally-powered vehicles. The owner refuels the fuel tank, which powers the internal combustion engine that delivers power to a multi-gear transmission, that in turn drives the wheels. This requires thousands of moving parts that need lubrication and eventual replacement, which is vastly different and more complex from the simple and more efficient powertrain of an electric car.